The 42-year-old company, led by reality show regular Travis Hollman, has become an unlikely backdrop for the post-workout flex. Recent projects for the $50 million company include Apple’s new campus in Cupertino and The New York Times’ millennial-focused workspace. But the booming gym and boutique fitness market currently comprises close to 50 percent of the business, founded in 1976 by Travis’ father, Joe Hollman. Travis, who took over as president and CEO in 2011, attributes that foothold to the trend-subscribing nature of the wellness industry. Most of that business has come from Equinox and SoulCycle, he says. Travis has been working with the celeb-cosigned spin studio since its 2006 debut. Whether or not you realize it, you’ve probably seen a Hollman locker. If you’ve toured the Dallas Mavericks’ new high-tech locker room, for instance, a collaboration with architecture and design firm Gensler. Facial recognition triggers a videoscreen on each locker, detailing the players’ personal lists of nutritional and workout information for the day. They also come equipped with ventilated shoe drawers and lighting that syncs up to circadian rhythms. Any time you see a certain keyless lock, where one-time users set number combos for access, that’s a patented Hollman Inc. product. And if you’ve been fortunate enough to visit the Champions Locker Room at Augusta National, you’d see lockers for Jordan Spieth and other pros that were designed with the help of Hollman. Other golf-course clients include Dallas National and Preston Trail. 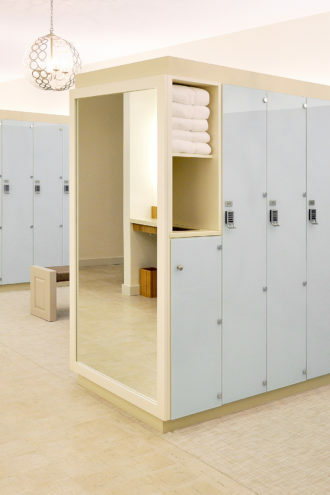 Hollman’s environmentally friendly lockers often utilize NanoLam, an antimicrobial, self-healing laminate that resists fingerprints or bacteria—a smart choice for professional sports clients like the Chicago Cubs and New Orleans Saints. But even more interesting than the company’s clientele might be Travis himself, who returned to his father’s company in 2010, after a career as a television producer in Hollywood. A disagreement with his father over Travis’ then-girlfriend sparked his departure from the family business in the ’90s. “His theory was, if I got married to her, she’d end up owning the company with me someday, and because he didn’t like her, that wasn’t going to happen,” Travis recalls. Eventually, the relationship ended. Travis got involved in a toy enterprise, worked on a movie, and produced a television series for MTV with Mark Burnett. The show, called Bully Beatdown, offered “bullies” $10,000 to take on a professional MMA fighter. It ran for three seasons. Working with Burnett, the reality TV pioneer behind Survivor, The Apprentice, and Shark Tank, was a bit prescient of Travis’ latest television role, as a “house husband” to wife Stephanie on Bravo’s The Real Housewives of Dallas. Cooper Fitness Center is among Hollman Inc.’s local clients. After a stint as an entrepreneur (Travis founded Vacation in a Bottle, an anti-energy drink with amino acids designed to, in his words, “kick the caffeine out of your body”), he rejoined the locker company with more experience and a vision that included partnerships with big sports and fitness franchises. Today, Hollman is the largest locker manufacturer in the country, doubling its workforce since Travis’ return.